The advent of TODD-AO defines a new motion picture era. It is the entertainment miracle born of inspired boldness and determination through the happy marriage of science and the motion picture art. Because this new process emphasizes a true feeling of audience participation and emotional involvement, I believe that, like the first born, Rodgers and Hammerstein's "Oklahoma! ", all great motion pictures of the future will bear this distinctive imprint. In designing and executing the murals of the Rivoli theatre, I attempted to tell the story of TODD-AO through design, color, pattern and composition. The color scheme employs sixteen shades of hues, luminous and clear, derived from the three primary colors. The composition of the murals is directional, from right to left, conforming with the entrance of the theatre. The mural depicts man's ingenuity in bringing entertainment to Mr. and Mrs. America through the small traditional screen ... and through the development of several other systems of greater scope and cinematic expansion. 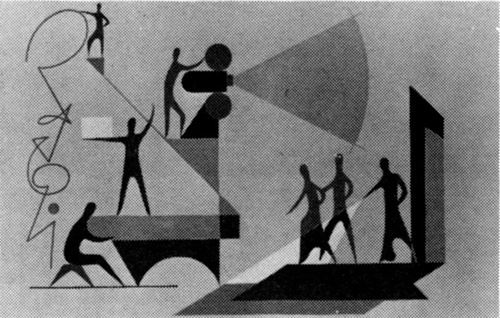 The problem in the primary stage of development of the motion picture art is essentially aural and visual - the eye and ear are shown directly above this grouping. The effort to improve cinematic art scientifically is through the lens and the speaker. 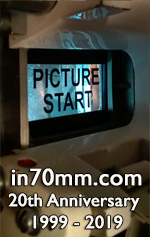 The placing of a symbolic figure designates the solution linking the basic problem with the development of the new 70mm film and especially designed TODD-AO camera and its "bug-eye" lens. The first-born of this union is Rodgers and Hammerstein's "Oklahoma!". The scientific linking of the two forces - aural and visual - is expanded in its scope through the TODD-AO wide angle deep curved screen. On the left side of this mural, actors, directors, composers, writers and cinematographic technicians are preoccupied in their work for the future when all great motion pictures will bear this distinctive imprint. 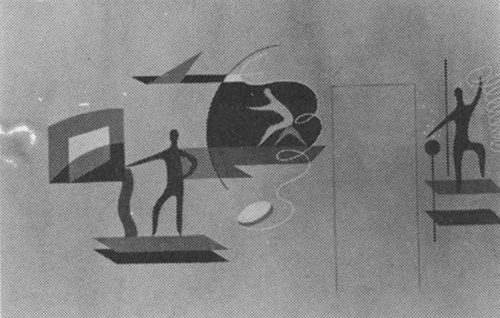 The mural depicts scientists engaged in optical research. The impact of the atom is symbolized by the atomic scientist in full control of this new force, directing the future development of the theatre of tomorrow, aiming to engulf the complete parabola of the human eye, horizontally and vertically, with picture and sound being the result of atomic impulses recorded magnetically. The movement of the murals is directional, from right to left. The story is of people engaged in motion picture production, confronted with the secrets of electronics, fountainhead for light and source of sound. Next, a dream, the training of aviators through film and the optical system. The next area represents the captains of the motion picture industry, confident, investing capital to bring finer entertainment to the vast millions through the perfections made available by optical science. The hopes and aspirations of the artist, the confidence of American capital and the indefatigable spirit of the optic scientist finally having captured the force, has harnessed all future productions through a process enriched with new sight, new sound, new screen - and where the "worst" seat is the best. The human ear and eye are at last satisfied. The mind and soul are elated. The composer and lyricist, the author and director, the actor and producer, are now able to tell a good story better - with boundless possibilities of expression. This panel is a tribute to the unsung heroes of the film industry; the janitor, the doorman, the usherette, the barker, the projectionist, the theatre manager, the press agent and the office worker.